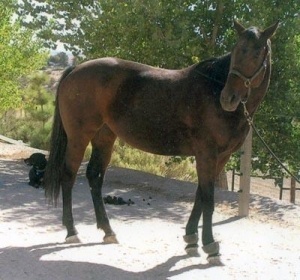 SUNNY, a Thoroughbred and a daughter of The Wicked North, was bred to race but came up lame during training for the track. Not wanting to absorb any costs for a useless horse, she was abandoned by her owner to be given away for free to whoever may have wanted her. Although put in training for dressage, because of her continued lameness issues, she was sent to and will remain with us at Heaven Can Wait.